At least since Descartes, philosophers have been interested in the special knowledge or authority that we exhibit when we speak about our own thoughts, attitudes, and feelings. Expression and the Inner contends that even the best work in contemporary philosophy of mind fails to account for this sort of knowledge or authority because it does not pay the right sort of attention to the notion of expression. Following what he takes to be a widely misunderstood suggestion of Wittgenstein's, Finkelstein argues that we can make sense of self-knowledge and first-person authority only by coming to see the ways in which a self-ascription of, say, happiness (a person's saying or thinking, "I'm happy this morning") may be akin to a smile--akin, that is, to an expression of happiness. 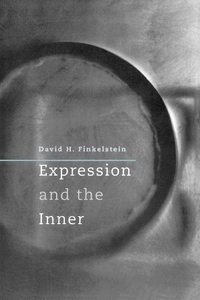 In so doing, Finkelstein contrasts his own reading of Wittgenstein's philosophy of mind with influential readings set out by John McDowell and Crispin Wright. By the final chapter of this lucid work, what's at stake is not only how to understand self-knowledge and first-person authority, but also what it is that distinguishes conscious from unconscious psychological states, what the mental life of a nonlinguistic animal has in common with our sort of mental life, and how to think about Wittgenstein's legacy to the philosophy of mind.